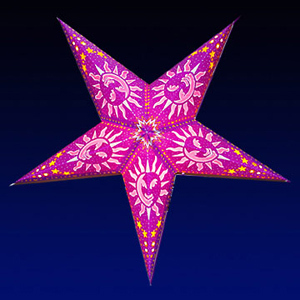 "Magenta Happy Sun Star Lamp"
This paper star lamp is from India. It measures 24' across. This is the same design as the Happy Sun star lamp with a magenta color twist. The sun design has a tissue paper backing which gives it a rich glow at night.Very funky and cool!